Halt And Catch Fire became a better show when the people behind it realized that Donna and Cameron’s relationship was the heart of the series. But, as compelling and downright heartwarming as the friendship between these two women has been, it’s also complicated. Not all opposites are bound together by their inevitable sparring, and not all opposing parts are complementary. Sometimes, the very things that bring two different, strong-willed people together are what are going to cause them to, eventually, explode. Tonight, Mutiny explodes. If I may exercise a critic’s prerogative here, I wasn’t sure I bought it at first. After watching the big boardroom fight that sees Diane, Gordon, Bos, and Donna unite to force the IPO that Cameron opposes, I rewound it and rewatched it. And then again. Each time, the question remained, “Is this earned?” Ultimately, I believe it is. Part of the problem in evaluating the scene is in how damned good everyone is in it. Toby Huss and Scoot McNairy, both their characters deeply torn at having to essentially choose between Donna and Cameron, do wonderful things with body language. As bound up as Bos and Gordon are in Mutiny and the two women who run it, they know this fight is between Donna and Cameron, and their averted eyes and slumped shoulders reveal how wrenching the moment is—and, essentially, how peripheral they are to it. 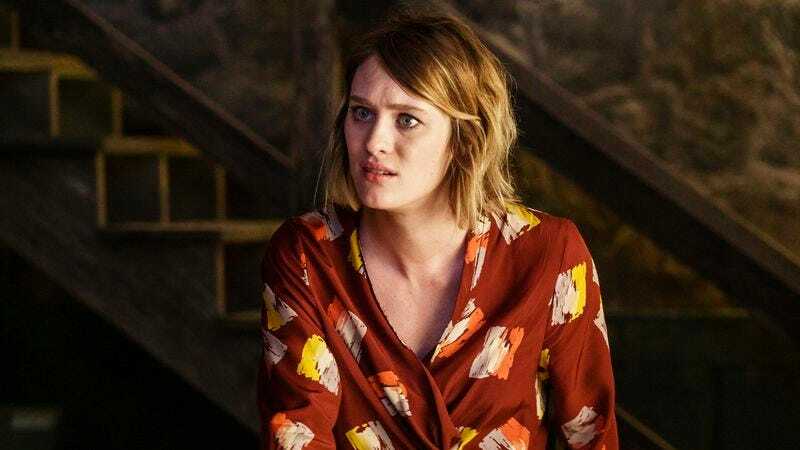 But it truly is about Donna and Cameron, and both Kerry Bishé and Mackenzie Davis start their characters out entrenched in the brittle coexistence they’ve been maintaining, then let their restraint crumble bit by bit, until the two are landing blows they’ve clearly been holding back for months. It’s ugly, and it’s painful to watch, the sort of big moment that a lesser show might trot out to shore up a sagging storyline. Here, it’s foundational, with Cameron, following Bos’ sage advice, attempting to lay out her vision for a future for Mutiny that can incorporate her ideas (slow down on the IPO while they implement her improvements) while still working toward the economic expansion desired by Donna and Diane. Donna counters that they have to strike while the lucrative CompuServe offer is on the table because they can’t count on the landscape being the same in the year or two Cameron will need. They’re squared off, but respectful, with Bos’ earlier advice to Cameron suggesting to us that things will work out in the end. They don’t. “Don’t patronize me. You’re handling me like you always do and I’m sick of it,” snaps Cameron, and she’s not wrong. Donna’s stuck playing mom to Cameron, and to Mutiny, and that means she’s stuck being the conservative, rational one. During her mushroom-aided dream last episode, Donna touchingly expressed (to an imaginary Cameron) both how much she needed her friend, and how much she resented being thought of as Mutiny’s hall monitor. Now, stung by Cameron’s accusation that she’s exactly that (“Who made [Mutiny] what it is and who’s just been along for the ride?”), she strikes back hard. “You’re calling me impulsive?,” Donna asks, incredulously, before calling out Cameron for being the “petulant child” that’s holding Mutiny hostage with her obsessive but ill-defined need to be its resident genius and moral compass. And she’s not wrong, either. “You two go to your corners, wipe the blood off your mouths,” Bos jumps in, but there’s blood in the air, and Cameron slams the door and forces a vote, saying she’ll quit if it doesn’t go her way. Everyone votes against her, even Gordon, even Bos. Cameron lets out a sob that comes from very deep inside, then walks out, shattered, to take Tom’s hand and leave Mutiny. It’s easy to write in a big scene like this, and, in the hands of this cast, it’s undeniably riveting. (Toby Huss’ “You’re breakin’ my goddamned heart” before he raises his hand to vote echoes ours watching him do it.) I’ve said that the brewing conflict between Donna and Cameron has seemed contrived, and it has. But this scene suggests that, however inelegantly plotted was Donna’s duplicity in lying to Cameron, this rupture was inevitable. Donna’s anger, then her iciness, look, at first, vituperative, even villainous, but, as Bishé plays it, it makes such horrible sense. Resentment created an explosive environment, and when Cameron goes low, exposing the cracks in the Clarks’ marriage, Donna blows. “Why don’t we see if your marriage lasts the year before you start doling out relationship advice,” is the ugliest thing Donna can come up with in return, but, again, it stems from the substance of the fight they’re having. Yes, Donna’s been witnessed being seduced by the example of Diane’s wealth and independence, but her criticisms of Cameron’s mercurial influence on their business don’t come from nowhere. Earlier, Bos repeats what both Cameron and Donna have said to each other in the past, advising Cameron, “You two need each other.” And he’s not wrong. It’s just that needing each other doesn’t mean that Donna and Cameron can make their partnership work. After this, it’s legitimately unclear if they ever will. Gordon turns him down but, having seen Joe’s research materials, he puts together what Joe and Ryan have been up to. He makes a lowball offer to Matthew Lillard’s Ken (taking 10 per cent of the estimated $25 million his lawyers claim he’s due), with the proviso that Ken will set him up with the NSFNET contract. And when Joe turns up at the mainframe to literally hand over the keys, Gordon offers Joe 49% of their new company, as silent partner. There’s a real sense of how shaky this venture is—it is Gordon after all—but it’s exciting, too, not least because I’ve missed the Gordon-Joe dynamic. Naturally, Halt And Catch Fire can’t help but toss another complication into the mix, as Ryan—kept in the dark about Joe’s plans until too late—releases both Gordon’s source code for Citadel and proof of Joe’s plan to keep Citadel a free product to the press. The show has always seen character and (often contrived) plot vying for dominance, but, here, too, the puzzling relationship between Ryan and Joe pays off, making the big, final reveal make sense. Ryan’s never been the most interesting character, functioning mainly to act flustered at Joe’s game-playing. But something in Ryan was drawn to Joe’s vision and, after satisfying his mind that Joe remains the visionary, he unplugs his phone, feverishly does what he believes Joe would do, then meticulously destroys his hard drive to cover his tracks. “They will never catch me. I am that good,” beams Ryan, as Joe, quietly slipping the key his new venture with Gordon back into his pocket, replies, “Nobody’s that good.” Earlier in the episode, Donna, advising Cameron to compromise, states, “Perfect is the enemy of good.” “The Threshold” isn’t perfect TV, but it’s damned good TV. The key to the last three episodes this season will be how Halt And Catch Fire can find a way to make tonight’s dramatic developments pay off just as satisfyingly. The scene between Bos and Cameron before the big meeting works so well because it gives us everything we’re hoping for—right before Bos’ always-reassuring, down home advice proves useless in practice. And, after all his advice, Cameron’s sheepish little “Hey, Bos, I got married,” and Bos’ quiet, heartfelt “Congratulations” is the sort of feel-good moment that also makes the following bloodbath so painful to watch. Tom can’t manage to carry new bride Cameron across the threshold. Later, Bos, apologizing to Diane for not coming home after their quickie in his car last week, confesses his criminal past, saying “I just thought you should know that—before I cross this threshold.” (Diane already knew.) The episode is called “The Threshold.” Just so we’re on the same page. I’ve always liked Mark O’Brien’s Tom, but, while he makes a decent match for Cameron, the episode keeps tossing in little hints—they can’t decide on a last name, neither of them technically proposed, that threshold—that the show has a rocky road in store for the couple.